Home / Lefse / Desperately Seeking Lefse! Her back against the wall, Beth Hagen had no choice but to make lefse with only dusty equipment not used in decades and vague lefse-making memories from her childhood. Result: not bad!! I was desperately trying to find somewhere to purchase lefse for Thanksgiving. 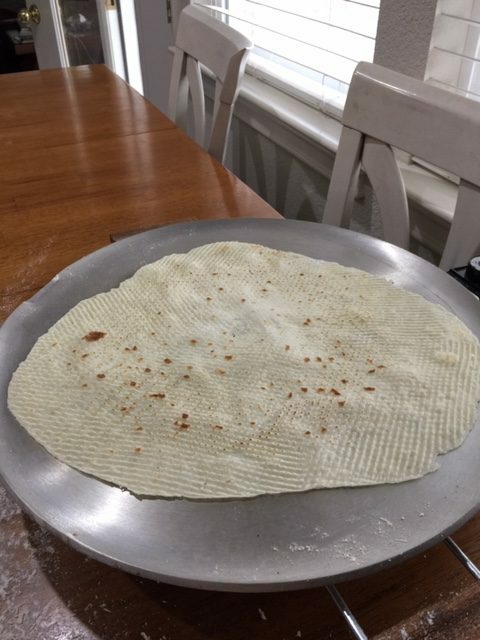 I’m a Scandinavian who lives in Windsor, California, and I haven’t made lefse since I was in my teens. Back then, I did the flipping part, and my mother, Ruth (Kvaal) Cornell, prepared the dough and rolled. My mother is gone now. For the last few years I had a wonderful woman here in the wine country of California named Lorraine Larson who ran a lefse business out of her home. We bought dozens of lefse from her over the years. Lorraine is gone also. So what to do? I came across The Lefse King online and had hopes of having some lefse shipped from my birthplace of Minneapolis. But, alas, Gary Legwold makes lefse for local pickup only. This forced me to do the unimaginable: attempt to make my own lefse — by myself! I pulled out a cookbook from the good women of Pelican Rapids, Minnesota, and gave it my best. It was a lot of work, but I’m delighted to say that for my first try, the 20 rounds turned out pretty darn good! At least my family enjoyed them. 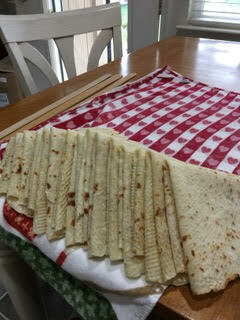 I thought my lefse seemed heavy, but my daughter Britt Bowden put her hand underneath and said, “No way! I can see my hand through it!” So I guess I rolled it thin enough. And my son in law Mike Bowden loved making Norwegian burritos with the leftover turkey and stuffing. Beth’s bounty of good-looking lefse. Bra gjort! That’s the good news. But now the family is looking forward to another batch for Christmas! My other daughter Kirsta and son Jens don’t live close. They’re in southern California. They were drooling over my photos. Cruel in their minds that they couldn’t have some. So I’ll be taking my lefse-making equipment on the road so they can have some around the first of the year. Next post: A Christmas Lefsepalooza!